Tonight as we celebrate/drink and/or mourn/render our garments over who will run our country for the next four years (Barry! ), I am here to offer a late night respite from the political craziness. Or, early morning comfort after getting through this stressful last leg of the political season. And I do so with a DYI post. So for those who don't know, Trunk or Treating is this product of the overly concerned suburban parent. Essentially in order to keep your precious younglings away from creepers who hand out fistfuls of pills and used needles, people do these things where members of the community or a church sign up beforehand, then all park in a big parking lot, pop their trunks and hand out candy to the sticky children who come by. In theory everyone who signs up is not a fart smelling weirdo injecting candies with pain thinner and therefore your halflings are safe to devour their high fructose corn syrup in that forty dollar costume from Target they'll grow out of by Christmas. Thus you don't have to fear this strange, dark night. 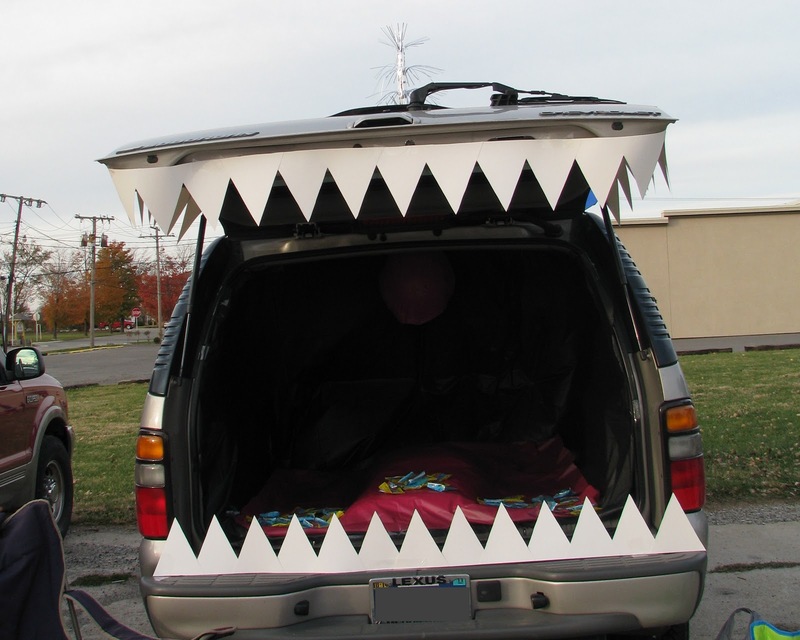 The cool thing about Trunk or Treat though is that if you love to decorate your wee heart out but don’t say, have a porch or front yard to trick out, going balls out on your car/parking space is totally encouraged. The trunk or treat I signed up for was a massive event, with about fifty trunks, so there was a lot of competition. Which makes coming up with a theme and decorations really fun. Hatchbacks are awesome for this, because you can throw down the seats and all of a sudden there’s all of this trunk space. But truck beds are also cool, and I even saw someone deck out a fishing boat on a trailer, a golf cart, and even a little Bulldozer with a bucket of candy in the scoop. So whatever you can park. Park it. Park you bike even. Just doodle out what you want to do if you feel like going beyond the cobwebs and jack-o-lanterns in your parking space. 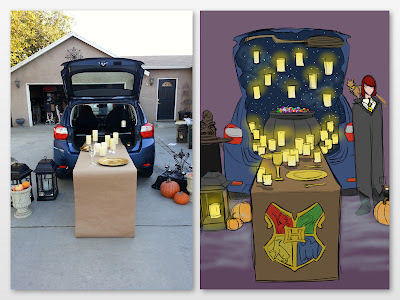 I had joined a group that needed a car and some decorating help yet had the theme of Harry Potter for the trunk, so I just went with that. I took a picture of my trunk, uploaded it onto my tablet and sketched out an idea for the decor. I came up with a design that went off of Hogwart’s Great Hall. this is me going overboard because i can't help myself. Even if you just draw a rectangle with wheels to represent your car, the idea is just to understand the space you’ll be working with and where everything will go. Obviously this is going to vary for a lot of people, but for me my goal was to not spend one dime on my decorating. I knew I would be able to accomplish it because I’m related to a craft supply/home decor fiend so I just borrowed 80% of my decorations and fabricated a small amount. 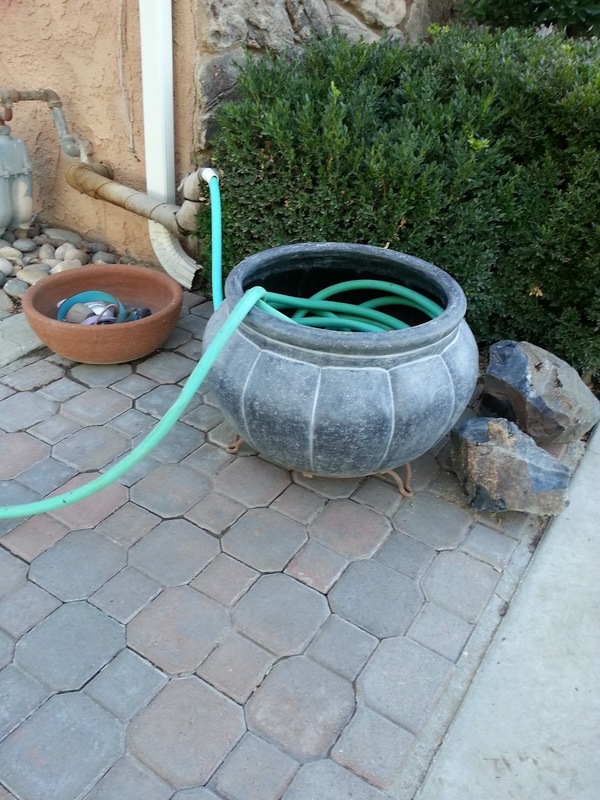 My cauldron was actually a big plastic garden hose pot that I just rinsed off. The crafter I knew also had a ton of battery powered candles that had never been used. So I jumped on that, leaving the plastic on them and pushing them up out of the protective plastic to make them sit on it and “float” above the table. There were also solar powered lanterns, an old chandelier, a collapsable table, a small closet rod, plastic planting urns, and some unused plastic pumpkins. Also, also, so much black masking tape, black duct tape and fishing line. 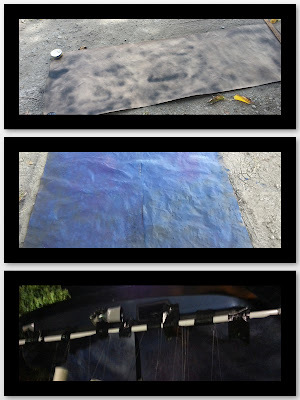 The “sky” was this brown craft paper I measured out to be taped from the top of my trunk and to secure down to the back for a forced perspective effect. I used some black spray paint the crafter had in excess of and knocked back the value, then took generic craft paint in various darker blues and used a roller to paint the paper. Finally, I hit the bottom of the sky with a little more black spray paint, and the tope with some white for a clouding effect. 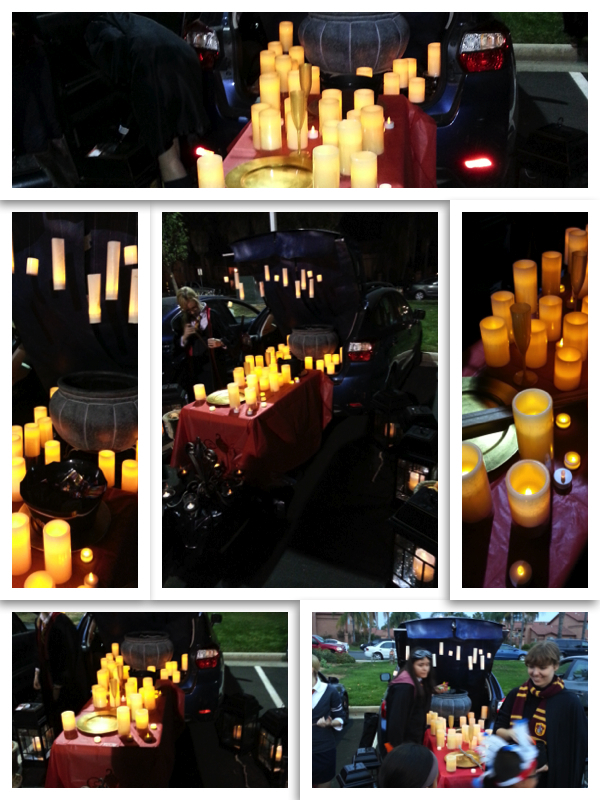 The floating candles were really easy. I took parchment, taped it to battery powered tea lights (again, from the crafter’s stash) and wrapped the parchment around each tea light, taping it in place. I punched holes in the tops and strung them on fishing line so I could hang them on a light rod I taped to the top of my trunk. Give yourself lots of time beforehand. 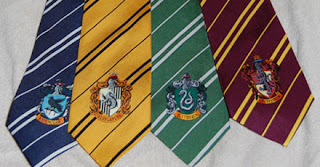 I never got to do a crest or a sorting hat, both of which I wanted to do. The sorting hat says I am a Hufflepuff, but Hufflepuff garb is hard to come by, and I didn’t want to spend any money. So I took a gold tie and black masking tape and made my own tie. I paired it with a white dress shirt, a black cardigan, dark slacks and dress shoes. I also had a hooded cape I threw on. Definitely one of the easier last minute Halloween costumes you can pull off. Especially if you don’t want to be Gryffindor. Just colored ties and masking tape! Fair warning though, children will not understand why you don’t want to be a Gryffindor, because Gryffindor is obviously the coolest. Arrive early, especially if you have a crazy setup. This also allows you to find a decent parking space. I duck taped a lot of stuff, carefully, to my car. Mostly the plastic parts as to not harm the paint. It's done! It's cool! Or you will know it's cool because the kids (and parents) like it. We had some of the franchise soundtracks and played them loud on the car's stereo for an extra Hogwarts effect. We also had a sword on the table to represent the sword of Gryffindor. 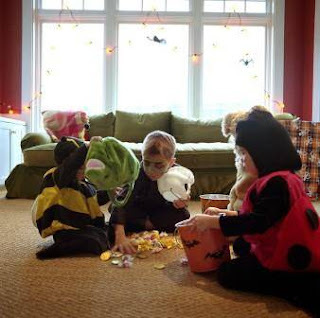 In all over three thousand ankle biters came by for candy, and got a taste of the wizarding world. Wow! This is pretty fabulous, Ash. You did an awesome job. Check out these easy to make faux candles from Mizerella.